I learned about floral couture when I attended my first Chapel Designer Workshop where Francoise Weeks was teaching. She was so patient and strategic about her work. It was truly inspiring. A few years ago when I decided to make a concerted effort to “perfect” my corsage and boutonniere work, I drew upon what I learned from my friend, Francoise, and along the way I’ve learned to embrace experimentation. I’ve also learned to embrace the power of floral glue. It can really unleash your creativity! 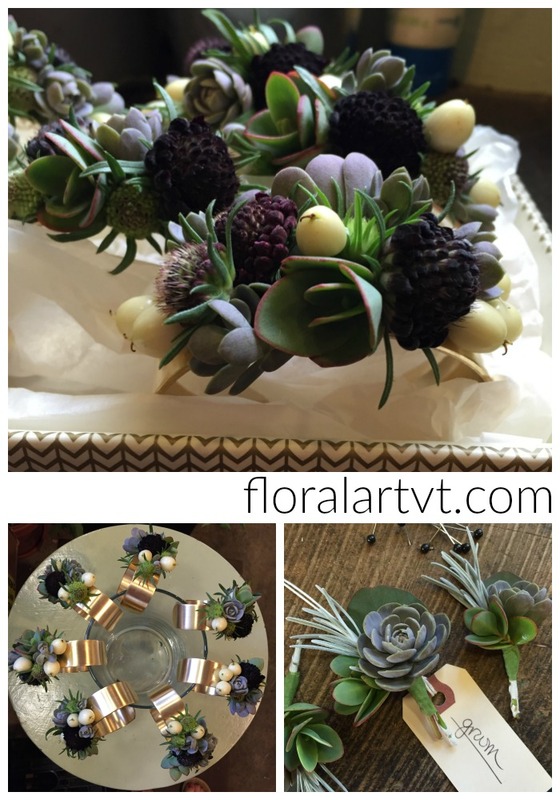 I grow a small selection of succulents outside of my studio door so I can pop outside and grab up a handful of pieces to include in my floral bracelets and boutonnieres. Included here are scabiosa, snowberries, and sedums. These brass cuffs with wearable flowers are a nice choice for moms, grandmothers and bridesmaids….they really are beautiful and each one is unique. If you don’t dig succulents, there are still wearable floral options for you, but the succulents tend to be a nice base and hold the glue nicely. If you’re inspired by floral jewelry, get some for yourself on your wedding day!…or any day. I’d love to make it for you!